Monday 28 May 2018 from 3pm - 4:30pm. St Andrew’s Cathedral School is a coeducational Anglican day school of over 1,250 students situated in two high rise buildings in the heart of Sydney CBD. The School was originally established in 1885 to teach the choristers of the Cathedral and seen a rapid development in the past two decades. The school opened its doors to Year 10-12 girls in 1999 and then K-12 in 2008. It has offered the IB Diploma since 2009 and offers MYP to Year 7 and then onwards from 2016. In 2007 it established the Gawura School, a K-6 school offering scholarships to local aboriginal children focussing on improving literacy and numeracy and teaching indigenous language, art and culture. From its traditional roots, St Andrew’s Cathedral School has become an innovative school known for its academic results, use of technology, caring staff and its creative and performing arts. In this talk we will present some work done marrying growth coaching and analytics, focusing on the approach and the impact that it has had on students’ performance and personal development over two semesters. At the core of the work is a systematic approach in gathering data on student wellbeing, effort and behaviour as well as academic performance. The purpose of the data collection has been using the data and make it available to different stakeholders via individual dashboards to track student goals and progress. The dashboard data is used to differentiate learning and tailor teaching and learning programs, providing an essential tool to help coaches to support students and to measure the impact of this project on student performance and capabilities. 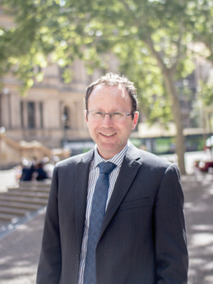 Brad was appointed as Deputy Head of School at St Andrew’s Cathedral School in 2013. Brad is responsible for academic, wellbeing, policy and staffing for the Middle School (Years 7-9) and Senior College (Years 10-12). Brad works with the senior executive team on vision development, alignment and strategy and is involved in cocurricular, risk management, marketing and budgetary planning. Brad’s aspiration is for every student to be able to reach their personal best and for teachers to be equipped to deliver highest quality teaching and learning programs. The School’s systematic use of data is key to this process by coaching students, developing class learning sprints, celebrating success and identifying intervention needs.